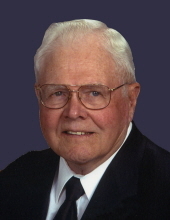 Floyd Lester Heishman, of Grinnell, Iowa, passed away peacefully on November 6, 2018 at the age of 94 years and 11 months at St. Francis Manor in Grinnell, surrounded by his family. A funeral service with military honors will be held at 10:00 a.m., Friday, November 9, 2018 at the Grinnell United Methodist Church and officiated by Pastor David Crow and Deacon Dave Heise. A graveside service at Sheridan Cemetery north of Grinnell will be officiated by Pastor Len Garrison. A reception will follow at Oakland Acres Golf Club west of Grinnell. Visitation will be held from 2:00 p.m. until 7:00 p.m. on Thursday at the Smith Funeral Home in Grinnell and the family will receive friends from 4:00 p.m. until 7:00 p.m. In lieu of flowers, memorials may be made to the Iowa City VA, Grinnell United Methodist Church, St. Francis Manor Foundation or to the donor’s choice, mailed in care of the Smith Funeral Home, PO Box 368, Grinnell, Iowa 50112. Memories and condolences may be shared with Floyd’s family online at www.smithfh.com. The son of Lester Joseph Heishman & Louise Mae Kellogg, Floyd was born December 6, 1923 in Poweshiek County, Iowa. Floyd attended School in Sheridan Township and Malcom. He farmed with his father and worked as a meat cutter at the Rath Packing Plant in Waterloo, IA before entering the Army for World War II on August 14, 1944. He served in Hawaii and the Philippines and was honorably discharged on September 1, 1946. He married Janyce Schultz on November 16, 1946 at the Sheridan United Methodist Church. They returned to Sheridan on November 2016 for a Marriage Blessing to celebrate their 70th Wedding anniversary and at the time of his death, they were blessed to be married 71 years and 11 months. Floyd and Janyce grew up less than a mile apart and lived and farmed in the Sheridan area for over 50 years. They moved to Grinnell in 1993. Floyd was a lifetime member of the Methodist Church. He was baptized and a member of the Sheridan Methodist Church, Tama United Methodist Church and Grinnell United Methodist Church. Floyd served on the Sheridan Township Trustee Board; Sheridan #2 School Board, Sheridan Cemetery Board, Director of Tama State Bank, and Director/Secretary of the Tama Livestock Auction. Floyd was a member of both the Grinnell Elks and the Tama American Legion for over 70 years; a lifetime member of the Veterans of Foreign War, Grinnell Country Club and was active in church activities. Those left to cherish Floyd’s memory are his wife Janyce; daughter, Susan Heise (David) of New Braunfels, TX; son, Larry Heishman (Marilyn) of Oakland Acres, IA, and daughter, Shirley Laraway (Dean) of New Ulm, MN; six grandchildren; six great grandchildren; one brother, Clinton Heishman; and three sisters, Bernice Sleeuwenhoek, Dorothy Stoker and Sally Douglas. He was preceded in death by his parents; brothers, Lyle Heishman and Earl Heishman; and two sisters-in-law, Barbara Heishman and Elaine Heishman. The family of Floyd Heishman would like to express their thanks and appreciation to the doctors and staff at the Iowa City VA facility, the Home Health Care Staff of Grinnell, the staff of St Francis Manor in Grinnell, and Grinnell Hospice for the excellent care he received. Floyd will be laid to rest in the new addition to the Sheridan Cemetery. This ground is especially meaningful as it was donated by his son, Larry Heishman, and was the ground where Floyd and Janyce lived and started farming when they were first married. To send flowers or a remembrance gift to the family of Floyd L. Heishman, please visit our Tribute Store. "Email Address" would like to share the life celebration of Floyd L. Heishman. Click on the "link" to go to share a favorite memory or leave a condolence message for the family.